With a few exceptions, the Western press and broadcast corps that trooped into Pyongyang to cover the recent 7th Congress of the Workers’ Party of Korea (WPK) deserves praise and our thanks. It was not an easy assignment. But let’s face it, we don’t just hand out bouquets here. There were gaps and shortfalls, and even some forays into the supercilious. In some cases, it is hard to decide who deserves the lower grade: the North Korean authorities in charge of handling the press, or the international media (by which I mean more than just the reporters on the scene). On the North Korean side, there seems to be a long-running inability to understand that Western reporters will not behave like the old Soviet-era journalists, and cannot be handled the same way. In North Korea, the press is part of the regime. That’s not a secret, and it is not something they try to hide. In the West, as we are proud to point out, the press often takes an adversarial position to those in power. The result? Drop western reporters into Pyongyang, and there is instant confrontation. No need even to shake or stir. The North Korean guides (“minders,” whatever) get a bad rap, but they are overworked and many are unprepared, especially for a large influx of foreigners during a major celebration. Their jobs, frankly, are impossible. They are doomed to fail, certainly in the eyes of the journalists. It would be interesting to hear these hard-pressed guides talk among themselves once they have their charges safely back in the hotel for the night. Bumps and bruises are inevitable as long as those in Pyongyang in charge of handling the foreign press are so heavy-handed. It’s very difficult for reporters not to include in their stories the fact that they are working in conditions unlike those they have faced anywhere else in the world. Still, something needs to give. Otherwise, the end result will be a constant repetition of stories from Western journalists about how they feel constrained in their reporting from Pyongyang, alternating with the by-now tired observation that they suspect everything they see is staged. It’s up to journalists and their editors to decide what stories they should be writing and airing. It’s up to readers and viewers to decide if, after reading or watching, they know any more than they did before. One thing I think we can safely say. Without a doubt, the complaints by journalists about not being allowed into the main meetings to observe last week’s Congress proceedings may be well founded. After all, the story for which they flew into North Korea was supposed to be the Congress. Reporters could just as well have watched it on TV in Tokyo or Beijing as they did in Pyongyang. At the same time, the complaining has a funny ring to it. On the second day of the Congress, after Kim Jong Un had finished his several-hours-long work report, at least 39 speakers rose in support. They were not speaking in English, and, as far as I know, there was no interpretation. I also don’t know if there were bathroom breaks. Can you imagine how annoyed foreign reporters would have been sitting through that? Without being there, it’s impossible to know exactly what else Western reporters could have done at each site they visited (e.g., a farm, a wire factory, a nursery, a hospital, an old armory.) Yes, the experience of being pushed through a schedule in Pyongyang is frustrating. I’ve been to North Korea. On more than one occasion, I told my guides that it was a waste of time to continue with a canned tour, and we would do better having a conversation outside. Nevertheless, there were equally times when staying and listening, and then asking questions turned out to be useful, even illuminating. In part, it depended on the questions. The “gotcha” approach, I found, rarely resulted in anything useful, and the game became tiresome for everyone. The North Koreans were always ready for the battle of wits, usually polite, sometimes exasperated, once in a while boldly firm. On the other hand, whenever I made clear that I wasn’t interested in a battle, that I wasn’t laying snares, they often relaxed and were happy to talk about non-controversial subjects, including their jobs and even their upbringing. Some of what they said was malarkey, some of it wasn’t—not altogether different from what one encounters elsewhere. Laying back and watching the interplay among the Koreans also had its rewards. Once leading us through a technology exhibit, the guide, following her script, mentioned how well the North’s electric power grid worked. “Oh?” said an accompanying minder. “Then how to explain the interruptions in power?” Silent daggers flew through the air between them, followed by a brief smile before we moved on. As for things being scripted or choreographed, surely reporters have experienced something similar elsewhere in the world. A good example—beautifully presented—of such efforts to control the story, with the consequent frustrations of an accompanying press corps, is related in Mike Chinoy’s documentary on the 1972 Nixon visit to China. Was the American press frustrated with both the Chinese and US sides during the visit? Oh, boy, were they ever. As for staged events, a young Ted Koppel witnessed and reported on a lulu of one during the president’s visit—a phony picnic that was taken down as soon as the Chinese authorities thought the foreign press had left the scene. After he reported it on US TV, Koppel heard that Chou En-lai had apologized for his side being so “ham handed.” Maybe it doesn’t hurt for Western reporters to squawk a little about their treatment in Pyongyang if that ends up helping someone in the North Korean hierarchy make the case up the line that the old-line tactics in dealing with the foreign press are increasingly counterproductive. What else do we learn from Mike Chinoy’s documentary? That one of the problems at the time was the ignorance of the US press corps about China—maybe not so different from today’s ignorance about the DPRK. Streets and roadways along the route (to Seoul) had been washed and swept, new shrubs planted, and anticommunist signs taken down or painted over. Very few of the 43,000 US troops then in the South were in evidence…Inside the historic pavilion [where a reception took place] were…several dozen gorgeous young women, many wearing flimsy dresses, miniskirts, or other alluring modern garb. I walked up to one of the beautiful hostesses and asked who she was and why she was there. “I’m a Red Cross volunteer,” she replied firmly, refusing to answer further questions. 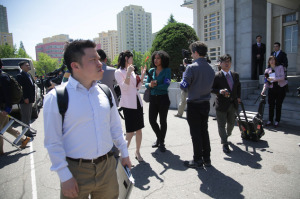 After receiving the same answer from another hostess of stunning beauty, I turned to a South Korean journalist familiar with the preparations. From him I learned that the (South Korean intelligence organization), which had devised the program for the North Koreans, had asked for and received the services of some of the country’s most beautiful young women from the national airline, modeling firms, and television companies, and provided each one with a substantial sum of money to buy whatever dress she thought showed off her features best. In return, she was to show up as a hostess for the North Korean visitors, without revealing how this had come about. In yet another effort to impress, the (SK) government took the visitors for a drive on the recently opened expressway that ran from Seoul down the length of the peninsula to the southern city of Pusan. To create more traffic, Seoulites were asked to drive their cars on the highway even if they had no place to go, and a transport firm was asked to drive its big trailers along the nearby parts of the road. A northern visitor, perhaps getting wind of this exercise in mobilization (the kind of thing that was commonplace in Pyongyang), congratulated one of the heads of the southern delegation for his success in “bringing all the vehicles in the country to Seoul” to buttress its claims to prosperity. “That was difficult, but not nearly as hard as bringing all the tall buildings here for you to look at,” was the reply. So what’s to be done today? Again, that’s for journalists and their editors to decide. I only offer a simple thought: that even with the constraints, there are things to observe, things to be learned, and experiences that open windows. When Jean Lee was in Pyongyang filing stories for the Associated Press (AP), she deserved praise for opening windows. During the coverage surrounding the Congress last week, there was similarly some smart and effective reporting, using a minimum of adjectives and adverbs that often get in the way in reporting on the North. The line that creeps into many stories—that “maybe these are real people, after all,” should be subject to a fine of $250 on the cliché scale. Of course they are real people in North Korea; if that is a story, it’s only because so much time and effort has been consumed suggesting it could be otherwise. In that regard, based on experience in other authoritarian countries, even if a man-or-woman on the street could be interviewed away from the minders and was willing to grumble about living conditions, there is almost no chance they would repeat anything but the official line on camera, even after a couple of beers. How many of the stories from Pyongyang noted that a farm or a factory visited had been swept clean? OK, it is an observation, but the implication is that if it is clean, there is something phony about the place. Why reach that conclusion? These sites are on display. They are supposed to present a good face for visitors. They are also “model” establishments, meant to inspire the domestic audience. You can bet they are also cleaned up when the leader pays a visit—and there are plenty of pictures on the internet showing exactly that. The fact that North Korean minder-guides have a patter and follow it carefully is not a surprise, nor is it illuminating. Is it really worth more than a passing mention anymore? The fact that North Koreans don’t have access to the internet has by now been repeated ad nauseam. That cell phones are expensive in the North tells us nothing. Does no one remember not so many years ago when US cell phones were also expensive, and minutes cost so much they were too precious to waste? That the North Korean economy is “behind” is not new. By now, journalists have worn out their computers typing the word “impoverished.” The real questions are where is the economy today relative to five years ago, what is the regime doing to deal with the economic problems, and how much success has it had to date? At a factory, how do they decide who does what job? (I once heard a factory manager explain that if someone complained to him about their job, he tried to find them something else to do in the factory. After all, if they weren’t happy, they wouldn’t do a good job, he said, and that wouldn’t do much for the production figures.) Who sets the production goals? Where do they get the raw materials? Do they get orders from overseas? Do they get any overseas investment? What does the North’s new “self development” line mean for their operations and plans? Where do the kindergarten teachers train? What are their most vexing problems? Do they confer with parents if a child has particular problems? What do the children enjoy the most? The least? North Korea is a serious place. It poses a serious challenge. We need serious reporting from there. Luckily, we benefitted from some of that last week. We can only hope for more.